This is the card I made for Siobhan when I sent her the prize for the challenge I had. I was waiting for her to get the pkg and she did a long time ago-I just kept forgetting to post it. I'm posting it now since I've been too busy **lazy** the past week to make something new. I got the sketch from the Mojo Monday blog. Very, very pretty.. I love the layout and the colors. That dsp was a favorite of mine. I will do my part in the "tag" this weekend. 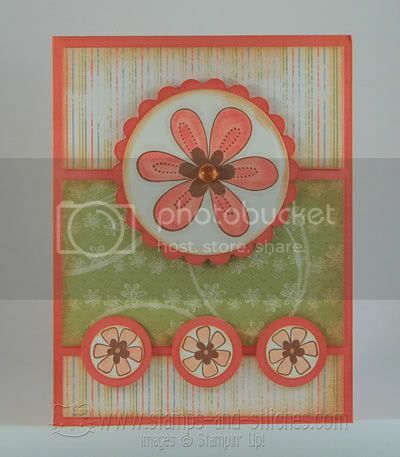 This is such a pretty, springy card! I love the background papers and the beautiful job you did on the flower images! Your cards are so pretty! What I'm really here to say though is that I am from Riverside too. I actually work in Perris now. Anyway, just like finding Peas who are from here or were. Great papers! These flowers are gorgeous. You need to teach me to color, LOL! Love it! Great card Gale! Lovely colors. Very pretty! I love that Cameo Coral card stock. Terrific cards, love those colors! This is a cute card! It just shouts spring! Great job! Gorgeous card!!!! Great colours and fabulous layout. gorgeous card! I love the colors! Great papers.